Tribes gather to discuss proposed policies and its impact to Indian Country. 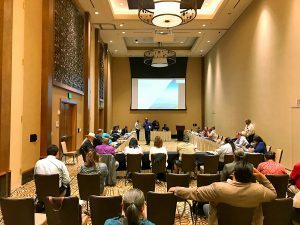 The Coalition of Large Tribes (COLT) held its quarterly meeting at the Twin Arrows Casino Resort in Flagstaff, Arizona on July 24, 2017. In attendance were COLT Chairman President Russell Begaye, COLT Vice Chairman Harold Frazier and COLT Secretary Marcus Coby. The Chairman of COLT, Russell Begay (Navajo), welcomed the attendees, emphasizing the need for tribes to work with the President and its agencies because there are several proposed policy changes from the Trump Administration that would impact Indian Country. 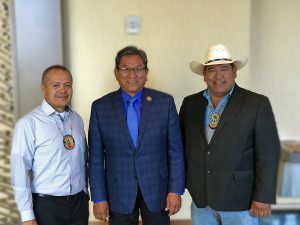 COLT Vice Chairman Harold stated, “As large land tribes, we have unique interests that are not addressed by NCAI” [National Congress of American Indians]. Marcus Coby is the Treasurer for COLT. The keynote speaker was from the Office of the Assistant Secretary for Indian Affairs, Dr Gavin Clarkson, BIA Deputy Assistant Secretary for Policy and Economic Development. He presented the new proposed policy Indian Trade and Commerce Act, which he claims is designed to empower tribes to develop their economic opportunities on their reservations. 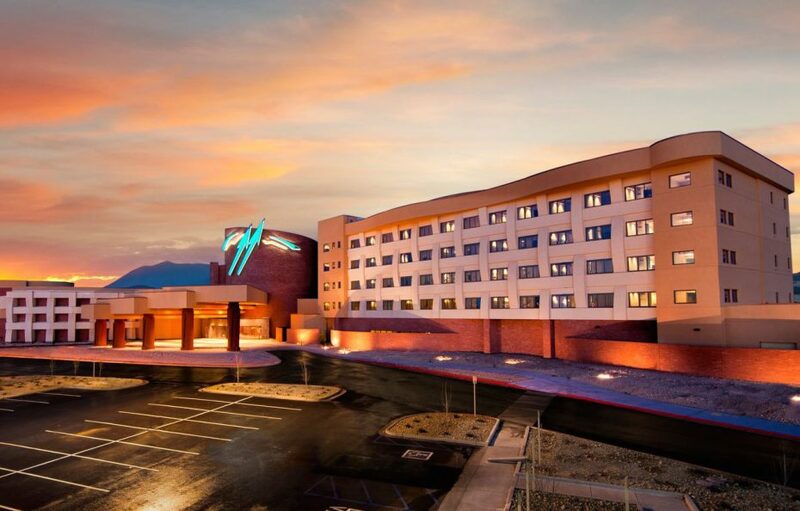 It would provide tribes the option to either retain current federal regulatory requirements, or to opt out of the federal regulatory regime, and possibly, develop their own tribal regulations. He stated that the Trump Administration is not seeking termination of tribes, but acknowledged that the BIA has failed miserably in their trust responsibility, and wants to give Indian Country the ability to determine what is right for themselves. Dr. Clarkson stated, “the BIA should not treat Indians the same as rocks, trees and bunnies.” The proposed rulemaking would update Traders with Indians, 25 CFR 140, and would create new regulations, Indian Trade Regulations, by September 26. Tribal leaders provided a variety of responses to Dr. Clarkson’s presentation, ranging from support for “the BIA’s getting out of the Indian business,” and questioning “how do tribes provide for increased businesses when the local crime rate promotes fear?” Shoshone-Bannock Tribal Councilman Tino Batt then questioned what would be the role of BIA, because it sounds like they are trying to walk away from their trust responsibilities to the tribes and for individual Indians, and pointed out the inconsistent and unequal treatment by BIA. Also on the agenda was an update on the Bears Ears National Monument from Natasha Hale, (Navajo) who indicated there has been overwhelming support (96%) from tribes, the conservation community, and outdoor retailers. Although the Trump Administration is proposing to reduce the size this monument, the Navajo Nation and NARF has indicated they will file suit in opposition to a reduced monument. Ms. Hale stated that this effort is an new expression of tribal political power, as tribes unite and establish new intertribal commissions, work with federal agencies, and use federal laws to protect tribal sacred lands. New conversations and alliances between tribes and conversations groups are emerging. COLT tribes offered support to the Bears Ears coalition and the continued efforts to fight to protect tribal sacred lands and culturally important sites. COLT is an intertribal advocacy group, composed of twelve tribes who have over 100,000 acres of lands, and are interested in protecting the sovereignty, jurisdiction and tribal resources of their reservations. The Shoshone-Bannock Tribes is a founding member tribe of COLT, and Chairman Nathan Small was an original member of the Board of Directors.